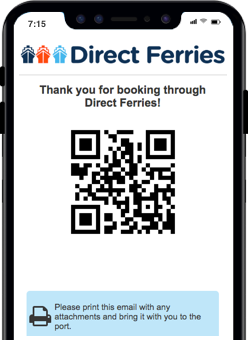 For more information, please visit our Ferries from Spain to Tenerife page. 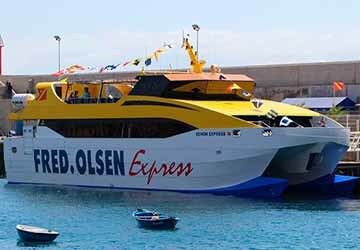 The Huelva Santa Cruz de Tenerife ferry route connects Spain with Tenerife and is currently operated by 2 ferry companies. The Fred Olsen Express service runs up to 2 times per week with a sailing duration of around 44 hours 30 minutes while the FRS VI service runs up to 1 times per week with a duration from 37 hr 20 min. So that’s a combined 3 sailings on offer per week on the Huelva Santa Cruz de Tenerife route between Spain and Tenerife. Compare now and get the best fare at the time that you want to travel. Prices shown represent the average one way price paid by our customers. The most common booking on the Huelva Santa Cruz de Tenerife route is a car and 1 passenger. The Spanish city of Huelva is the capital of the province of Huelva in the autonomous region of Andalusia in the south west of Spain. The city, and its port, lies on the Gulf of Cadiz, where the River Odiel and River Tinto meet. The city's long history dates back to around 3,000 BC and many Roman artefacts have been uncovered in the city which bears testament to the Roman mint that was once located in the city. Visitors to Huelva will find many things to do and see in the city and the surrounding area. There are a number of sites that have an association with the explorer Christopher Columbus which include Moguer, Palos de la Frontera and the Rabida Monastery. In addition to these sites there are fine examples of Baroque architecture to be found in the Condado part of the city. One of the highlights of the city's cultural calendar is the Pilgrimage of el Rocio, which has been declared of International Tourist Interest. The ferry port at Huelva is located in the Exterior Port and is accessible via a free bus service that takes travellers from the port to Huelva city centre on arrival and from the city centre to the port for departures. Santa Cruz de Tenerife is a port city located on the Spanish island of Tenerife, the largest of the Canary Islands. The city has an important port and is filled with wide streets, beautiful landscaped areas and some fine examples of modern architecture. The city can trace its back around 400 years when the city began to develop in the late 16th century aided by its port which enabled to city to become the second most populated city in the Canary Islands. The centre of the city sits on the site of the former fortress of San Cristobal and is looked over by the monument dedicated to the Triumph of Candelaria, which is a neoclassical sculpture in Carrara marble and was created by the Italian Pasquale Bocciardo. This part of the city is also overlooked by the 18th century Baroque facade of the La Carta Palace. In the centre of the city, near the sea, several of the busiest streets and squares of the capital meet, such as the Plaza de la Candelaria. From the city's port there are ferry services departing to mainland Spain and to the other Canary Islands.